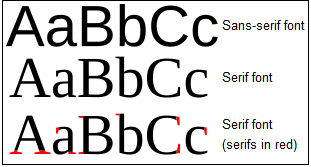 According to Wikipedia, typeface is designed as a set of characters that share common design features. Typeface is usually represented by things like style, condensations, width, slant, and ornamentation (among other things). The text on your document, presentation, or website is the crux of your item. People need to be able to read the information that you are presenting! Much like the information she gave on color palettes, Bianca Woods at Learning Solutions 2013 gave some great information on using typeface in your documentation. Unfortunately, I did learn that despite my best efforts I will probably not be bringing back Comic Sans to the mainstream. Kidding aside, typeface is very important when publishing material online. Here are a few tips to keep in mind when choosing a typeface. Which font do you use then? Typically, serif fonts are great for paper materials, while sans-serif fonts are the more popular choice for computers, tablets, and phones. Keep this in mind when choosing your fonts! I recommend that you should use one of each (serif and sans-serif) when creating your materials. Find two that complement each other and it can add a nice touch to your materials. Emphasis can be hard to get across in text. If you had to guess what someone’s go-to strategy for emphasis was, what do you think it would be? YEP. IT’S ALL CAPITAL LETTERS. SURE, I’M MAKING IT A POINT THAT YOU READ THIS, BUT DOESN’T IT FEEL LIKE I’M YELLING AT YOU? DO YOU REALLY WANT TO READ A TEXTBOOK OR POWERPOINT THAT YELLS AT YOU? WHAT? Use bigger sizes to highlight titles and paragraphs. I’m not saying a massive size like 72pt though. Something a few points higher will do the job just fine. Use bold or italics (bold more specifically in my opinion). The darker and stronger the font on screen/paper, the more likely someone’s eye will move to it. The italics also add a nice touch. Do not use underlining. When someone sees an underline online they automatically assume a hyperlink. Underlining will just cause confusion. Do not use different colors. As awesome as hot pink or neon green is, this can cause issues with readability. Also, using crazy colors will make your website/presentation inaccessible to those with vision impairments. I hope that you have found these tips helpful. Give some new typefaces a chance! See what you like and see what you can read. A nice typeface can really spice up a presentation.